The last vestiges of European colonialism were washed away by the tide of self-determination that rose in Asia after World War II and swept across the globe in the second half of the 20th Century. At least, that's what the history books tell us. But Riccardo Orizio knows differently. In Sri Lanka and Namibia, Jamaica and Guadeloupe, Haiti and Brazil, small bands of colonials survive and are fighting a last ditch battle against the forces of history. 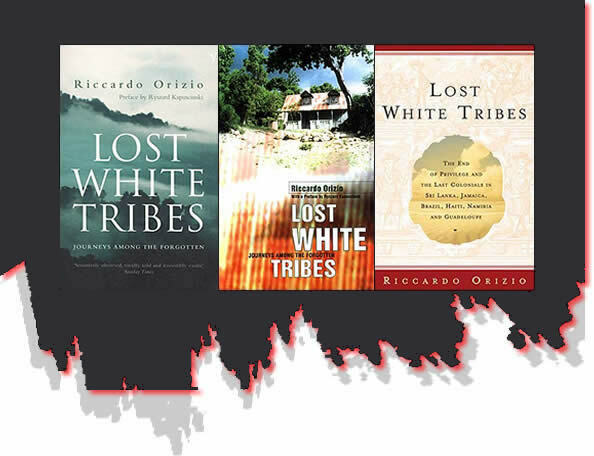 "Lost White Tribes" is Orizio's account of his encounters with these dwindling colonial outposts. They aren't easy to find. They cling to each other and to their isolation as a defense against the world around them. Some, like the Basters of Namibia, seem perpetually girded to battle for what they consider to be rightly theirs, but the battle never comes. In truth, the battle was waged -- and lost -- long ago. In Sri Lanka, the Burghers, descended from the Dutch merchants, Portuguese sailors and British functionaries who, by turns, ruled the island, maintain social airs outdated a century ago. Orizio describes an afternoon at a Burgher home. "The nice thing about a casual Sunday gathering of friends is that everyone can relax as if they were at home and chew over the family gossip. Food is placed on little tables on the verandah and eaten without benefit of cutlery, in accordance with the elaborate manners of an older generation, which dictate that you use the tips of your thumb and three fingers of your right hand only." The author, a former newspaper reporter, is Senior Editor for CNN Italia. (Note: the reviewer is also an employee of CNN, but as of this writing has never met Riccardo Orizio.) He views these archaic colonials with the eye of a journalist, not a historian. As a result, "Lost White Tribes" is episodic and anecdotal. It is not a treatise on the post-colonial world. Sometimes, the stories are a bit jumbled. A Dutch Burgher of Sri Lanka, for example, might have an Italian surname. In Haiti, the descendants of Polish mercenaries who turned against their French commanders might have skin as dark as the descendants of African slaves, but their blond hair proclaims their ethnicity. The story of each group is unique, and strange. The Namibian Basters, for example, began as part of a Boer immigration out of Cape Province in South Africa. In Jamaica, there are communities descended from German immigrants who sold their freedom for the hope of prosperity. They got neither. In the jungle of Guadeloupe, the secretive and frighteningly in-bred Blancs Matignon cling to their reputed descent from French nobility as they shun contact with the rest of the island. Perhaps the most fascinating of the "lost white tribes" is the Confederados of Brazil. Their great-great-grandparents fled there after the Civil War, determined not to lose the Confederate way of life as they had lost the war. Each April, they gather near the town of Santa Barbara to celebrate their roots. "For hours, three hundred Americans strum banjos and blow trumpets while the children play, the boys dressed in gray uniforms with yellow stripes, the girls in pink and blue frocks with bows of the same colors in their hair, looking like prettily wrapped sweets." There's even a beauty pageant, where "Miss Arkansas" competes with "Miss Tennessee" and other Southern belles in a bathing suit competition. Overseeing it all is a life sized oil portrait of Robert E. Lee. Orizio is a keen observer and a fine writer. His descriptions of the landscapes and the people who inhabit them immerse readers in distant and exotic places, where they are not always welcome. Some of these remote bands of people have made their peace with isolation and are fiercely protective of it. 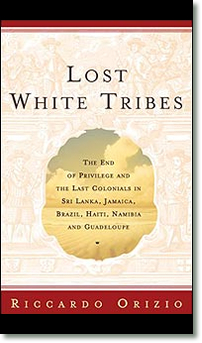 "Lost White Tribes" does not pass judgment on the colonials that time has forgotten. Those who wish to make their own case to the world are allowed to do so. But what goes unsaid -- the grinding poverty that is the main feature all the "tribes" share and the sense of denial that pervades their stories of themselves -- speaks volumes.